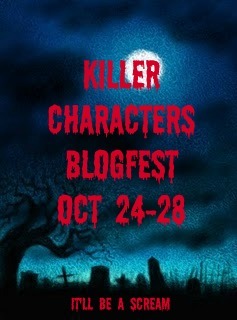 The day has arrived for the final installment of the Killer Characters Blogfest, and dare I say I will miss it? I do dare, becasue it has been such a fun ride! Today we are talking about the mean and nasty antagonist! The moment I thought of this antagonist waves of hatred flowed through me. I don't think there is a single literary character that I hate more than Dolores Umbridge! The reason she is badder then all the baddies, even worse then Voldemort, is becasue she is oblivious to her vile nature. Voldemort at least knew what he was doing when he became The Dark Lord. Umbridge, on the other hand, thinks it's just fine to punish children by scarring their hands with the words "I will not tell lies". Dementors in the courtroom? No issues there. Stealing magic eyes from dead people? They weren't going to miss it. Oh how I hate her sickly sweet exterior and her black, black insides. Scariest. Character. Ever. Anyone dressing like Umbridge for Halloween? If not, what are you dressing up as? Bleh! I can't stand her and all her cat plates. You nailed it with yher for sure. She is great! I almost picked her. What I love about Umbrage is how surprising she is. Everything about her goes against the cliche of how she looks. Awesome! Yeah, Umbridge was the absolute worst. I think the fact that she was so cruel to children made her even more vile than other villains. Great pick! And, I will miss this fest too, it's been so much fun! Ha! 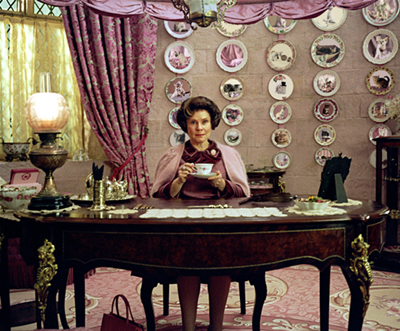 Dolores Umbridge was unreal. And I really thought they captured her character in the movies. Great post. I agree! She is completely the most evil character ever made - I really couldnt stand her! Great pick! OOOH! Great choice!!! Hadn't even thought of her. My first thought was Mr. Hyde from Robert Louis Stevenson's "The Strange Case of Dr. Jekyll and Mr. Hyde." Then Iago from "Othello" and Professor Moriarty from "Sherlock Holmes." Oh man, she's really the one I would've picked. Definitely on the top of my list of "Most Vile Character." Great choice, and you absolutely nailed it as to why she is so horrible: because she's oblivious to her own vile nature. ha! I hate Umbridge too. She's so evil. I love the idea of someone dressing up like her for Halloween – those are some pics I want to see. Ew good choice! She gives me the crawlies every time I read that book! (or watch the movie). I'm dressing as a devil. Mwa haha. Awesome choice! The scariest badgirls are the ones who smile through the horror they leave in their wake. Majorly creepy. Thanks so much for participating! Oh, this is a GOOD one. I love when bad comes wrapped in something that is supposed to look good. Great Job! Maybe I should ;) she sounds pretty vile. Oh, how I hated Dolores Umbgridge. Rowling did an outstanding job of creating her pathological character -- sweet with a dagger behind her back. Ironically, Emma Watson and Daniel Radcliff, said off screen she was so nice and very funny. But, I didn't want to believe them! It's funny how we become involved in characters -- sign of a good writer. So perfect. She's horrible. Awful. Everyone's worst nightmare in her sappy sweet voice and evil carving. Love this post! Umbridge! Yes! Fabulous choice. Man, she is wicked. Pure evil and she doesn't look the part. She gives me the creeps. Great choice. 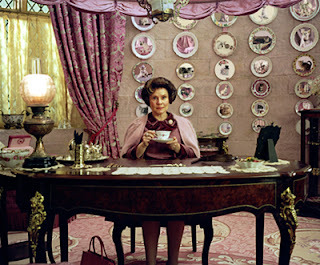 Umbridge is such a chilling character, but I don't agree with you when you say she doesn't know what she's doing. I argue that she's completely aware that she's evil, and she likes it. I don't think she is at all unaware, and that makes her even worse to me. Creepy, black character...and you are right, somehow more perversely evil than Voldemort. Voldemort had understandable motive whereas Umbridge was pathologically evil to children! I don't think there's a character I hate more, either! Oh, that's such a great choice. She is pure evil. I never liked her, and it's good to see I'm not the only one! Oh God, I hate Delores too! She actually looks like a boss I had once, right down to the little streak in the hair and the sadistic personality. Good choice! Wasn't Umbridge something else? I'd thought Snape was the worst but then she showed up. Vicious, vicious woman. Oh yes, the real nasty of the story! Oh, I totally agree. I actually have a hard time reading book five just because she is so, so evil. Ooooooo! She is the NASTIEST!! I'm with you on the Dolores-Hating bandwagon. Can. Not. STAND. Her! I have given you an award on my blog, breakingfantasy.blogspot.com!